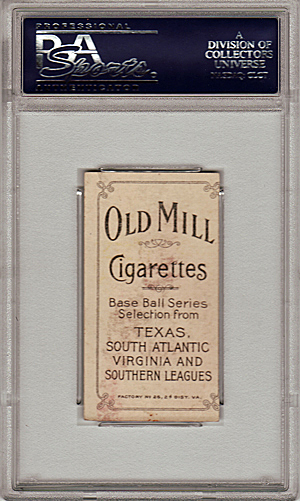 I have stated on his blog on more than one occasion, that collecting baseball and basketball cards from the United Kingdom comes with its challenges. There are no local card shops or shows to visit and importing boxes or valuable cards, brings with it expensive shipping, customs and handling fees. But, being based in a country which has little interest not only in the hobby, but the game of baseball itself, can bring occasionally have its benefits. Every so often an item appears on the UK version of eBay, listed by a local seller which presents an opportunity to avoid some of the above challenges and make a hassle free purchase. When the seller also decides to make the auction open only to collectors based in his home country, then with less competition the possibility of bargain may also be on offer. 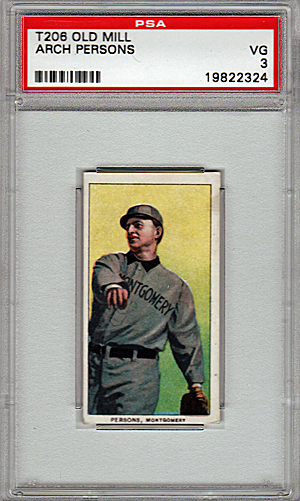 To my surprise, a seller listed recently listed some PSA graded T206 cards. Since my decision a few weeks ago to focus some of my attention on baseball, I have found myself revisiting the early history of the game, through the excellent Ken Burns 1994 documentary Baseball. This in turn had me researching the vintage cards that featured players from the early days of the game. Very quickly, this led me to the classic T206 issue. So there was little chance of me passing up on these particular cards when I came across them. Archie Persons career totalled four years in the Minor Leagues, the first three of which were spent plain for teams in Alabama, Arkanas and Texas. In 1912 he then is recorded as having played for a team (Bassano Boosters), 2,000 miles to the north in Western Canada. Despite a batting average of .378 which topped the Western Canada League that year and earned him a batting title, Persons is not recorded as featuring in semi-pro or pro baseball again. The career of Ray Ryan spanned over 60 years in minor leave baseball, during which time he featured as a player, manager, scout GM and owner. His playing days were spent as a catcher primarily in Virginia, but in 1910 was signed by the Chicago White Sox and attended Spring Training. It is quite possible he would have found himself catching for pitching legends such as Ed Walsh & Doc White. He did not feature for the White Sox and sixteen games into the season returned to the minor leagues. As far as I can gather, it was the closest he came to playing in the major leagues. 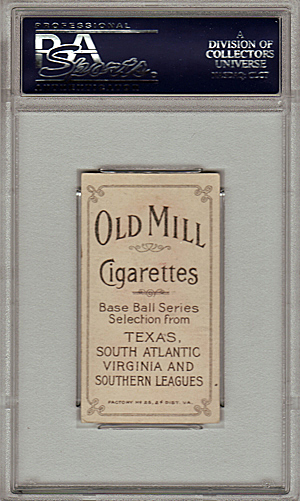 I admit I love reading about the careers of old ball-players that feature on baseball cards and there is little doubt that over time I will add some more from the T206 and other vintage issues to my collection. My biggest struggle with these cards, are that they are slabbed. These are my first T206 cards and I am not able to physically have them in hand (albeit briefly before I put them in a top-loader!) which takes away some of the pleasure of collecting in my mind. Whilst removing them from the PSA holder will reduce their value, I have not bought them to sell them. But before I do, I need to make a decision in how I am going to collect cards from this set. Do I purchase graded or ungraded cards? Some further thought is required. I think it's easier to purchase cards that aren't graded. 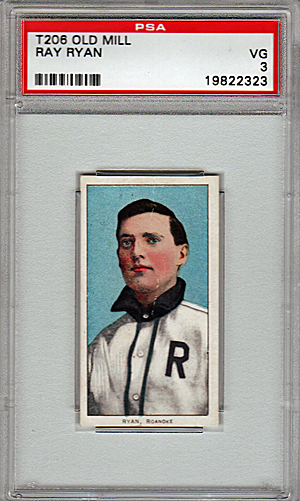 Anytime a piece of cardboard is slabbed with a number on it, no matter what that grade may be, it always seems to demand a higher price than a card that's not slabbed. I agree with you completely, if I can't touch it then it doesn't mean as much. One of the joys of the hobby is being able to feel the cardboard...even if it's over a hundred years old.